"3LA1, V-1992" by Timothy K. Perttula and Robert Z. Selden Jr. CONTEXT INFORMATION: Found together with V-1987-1991 and V-1993 and V-1994 in Burial 1, Burial Plot 2 (Martin 1939). DECORATION: The upper part of the rim has a horizontal engraved band filled with short diagonal lines. The remainder of the rim is divided into nine rectangular panels divided by engraved brackets; the engraved brackets have a single short vertical engraved line within it. Four of the panels have a short centrally placed horizontal engraved line within it, while the other five have a single row of excised punctations. Belcher Engraved, var. 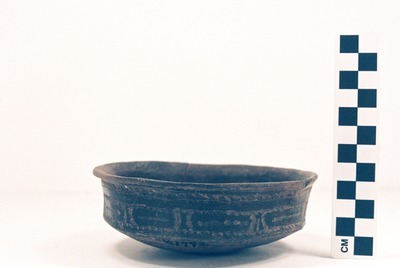 Owen carinated bowl (5425-635).